Rum and whiskey are the best choices for a spiked mango iced tea. In this recipe, the two come together in spectacular fashion. The fruit flavor actually comes from the rum, and it's backed up by a very smooth Canadian whisky. Plus, unlike the Long Island iced tea and similar "tea" mixed drinks, this one actually includes real tea! It's a delicious, refreshing, and quick drink that can easily become one of your new favorite summertime cocktails. The mango iced tea recipe was created by Bobby "G" Gleason, Beam Global Spirits' master mixologist. That's why it features two of the liquor company's bottles: Canadian Club Classic 12 and Cruzan Mango Rum. It's a wonderful combination that offers a hint of the fruit's exotic flavor and it's one of the easiest mango-flavored cocktails you can mix up. Add the whisky and rum to a highball glass filled with ice. Top with iced tea. Stir briefly to incorporate. Garnish with a lemon wedge. Any iced tea will work just fine in this recipe. Green tea tends to be a favorite for making iced tea, though oolong is an excellent option as well. This is an excellent recipe for mango-flavored iced tea as well. It's a popular flavor among bottled iced teas and should be easy to find at most grocery stores. 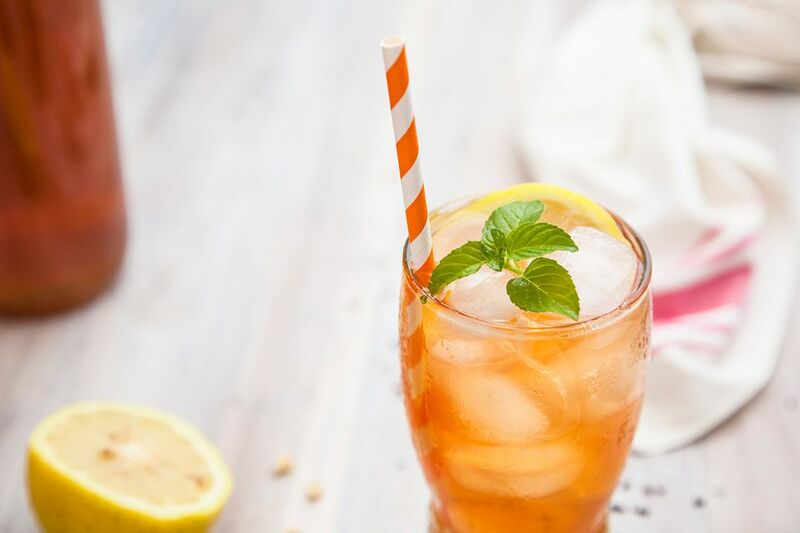 Fresh mango iced tea is easy to make: Add one fresh mango (peeled and diced) to the standard simple syrup recipe (1 cup sugar and 1 cup water brought to a boil). Mash the mango slightly while simmering the syrup for 10 minutes. Strain out the fruit once it's cool. Brew tea and let it cool (if using hot water), then sweeten the tea with the mango syrup to taste. Increase the ingredients to make a full pitcher of mango iced tea. Keep the ratio at 1 part each of the whisky and rum to 4 parts tea. Either add ice to the pitcher or in the individual serving glasses. Keep the pitcher in the refrigerator for a quick afternoon cocktail or serve it at a backyard barbecue. You can also use the whisky or an aged (unflavored) rum alone—pouring a full shot into the drink—when using mango-infused tea. While Canadian whisky is recommended, pour your favorite style of whiskey, if you have a preference. This recipe can feature any flavored rum you like. Try it with apple, citrus, coconut, pineapple, strawberry, or vanilla rums as well. Give your iced tea a little sparkle by finishing it off with a clear soda (e.g., club soda, ginger ale, etc.). Sparkling wine would also be a fun option, especially when served short and "up" in a cocktail glass. How Strong Is a Mango Iced Tea? Perfectly casual, the mango iced tea is only as strong as the average glass of wine. When mixed with the suggested spirits, its alcohol content will be around 11 percent ABV (22 proof).